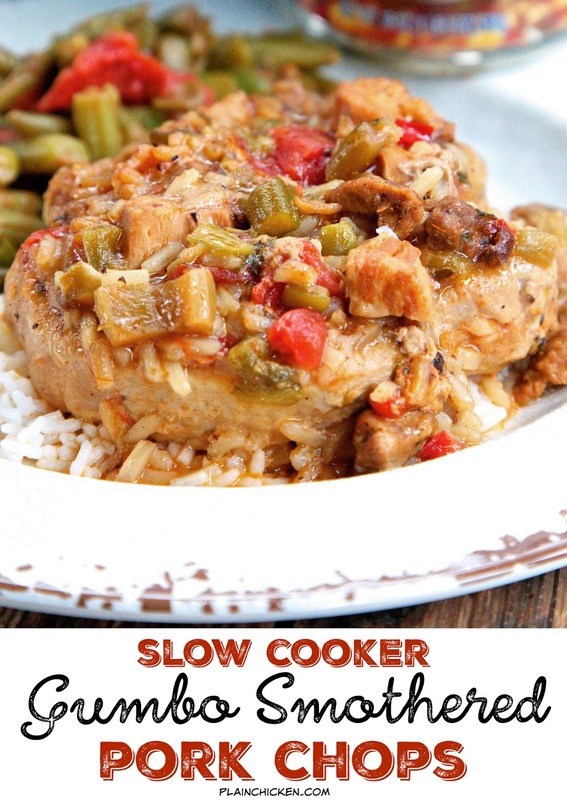 Slow Cooker Gumbo Smothered Pork Chops - pork chops seasoned with cajun seasoning and slow cooked in Progresso™ Chicken and Sausage Gumbo. SO easy and super delicious! This was a huge hit in our house! I am a big fan of canned soup. It is one of my go-to lunches. It is quick, easy and tastes great! I also love to cook with canned soup. Canned soup is a great way to easily add tons of flavor without a lot of work. The folks at Progresso™ are running a contest where you create a recipe with Progresso™ soup and/or stock and 6 or fewer ingredients for a chance to win $5,000! 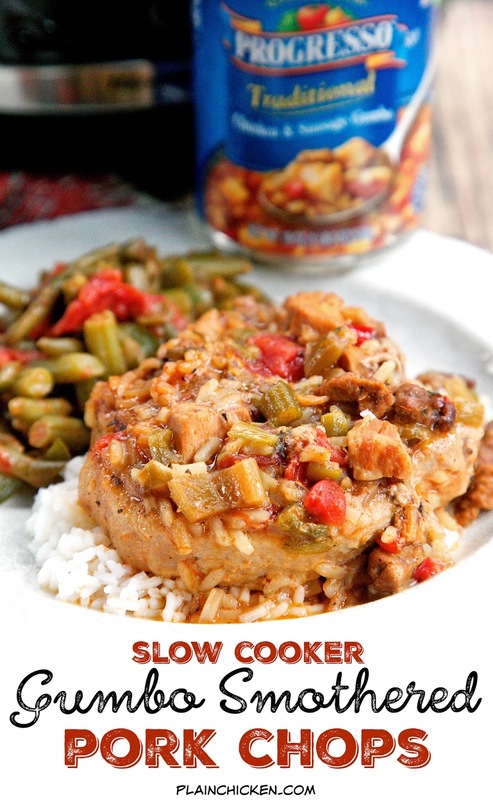 My entry is this Slow Cooker Gumbo Smothered Pork Chops. 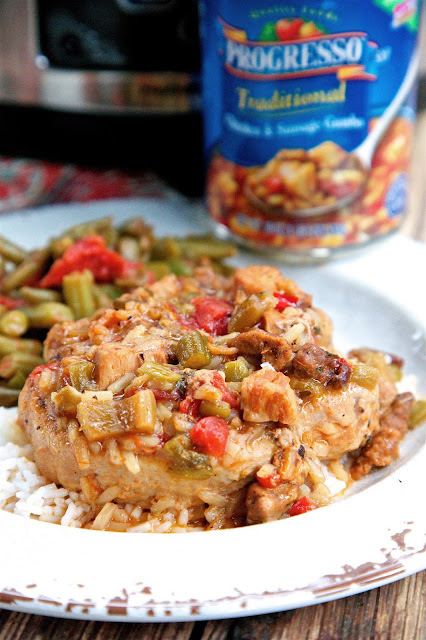 Pork chops slow cooked all day in a can of Progresso™ Chicken & Sausage Gumbo. I served the pork chops over some rice. They were crazy good! The best part is that it only took about 5 minutes to prepare the pork chops and the slow cooker did all the work. 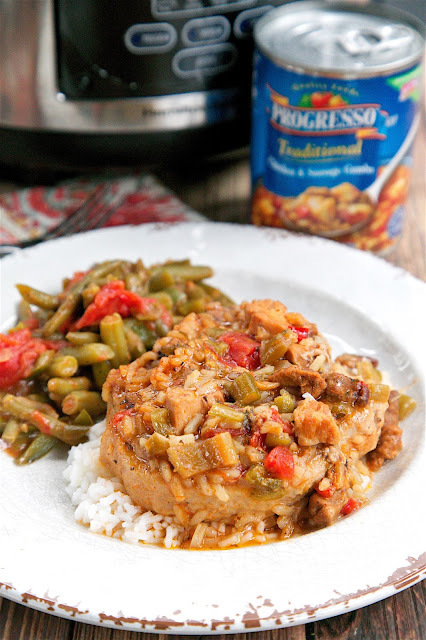 The Progresso™ Chicken & Sausage Gumbo added TONS of great flavor to the pork chops. It was great to just open a can and dump it in the slow cooker. Submit your recipe to http://www.foodnetwork.com/freshrecipecontest for your chance to win $5000 in the Progresso™ Eats Sweepstakes! Place browned pork chops into slow cooker. 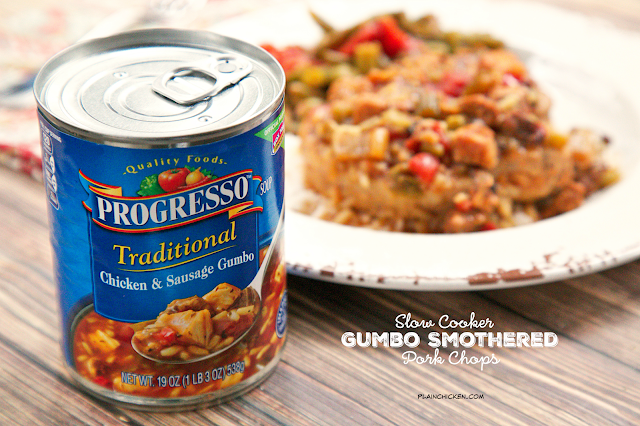 Pour the Progresso™ Chicken & Sausage Gumbo over them. Cook on low 6 hours. Serve over cooked rice. This is a sponsored conversation written by me on behalf of Progresso. The opinions and text are all mine.